StrikeForce®-S contains dicyclanil in a unique solution. 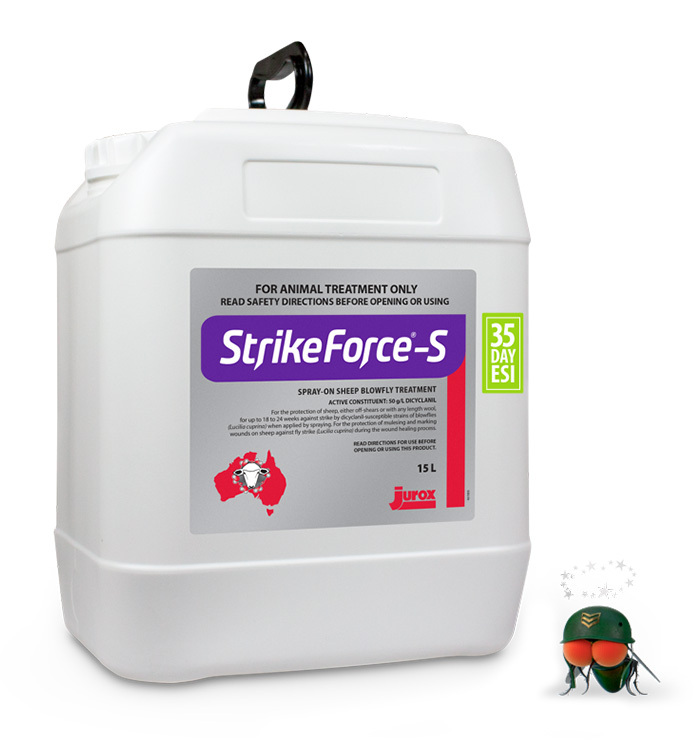 This unique formulation, developed and manufactured in Australia, provides farmers with up to 18 to 24 weeks of protection against blowfly strike, whilst having a low meat WHP of 14 days and an ESI of only 35 days. Containing dicycanil, the most effective active for prevention of blowfly strike on sheep. For the protection of sheep, either off-shears or with any length wool, for up to 18 to 24 weeks against strike by dicyclanil-susceptible strains of blowflies (Lucilia cuprina) when applied by spraying. For the protection of mulesing and marking wounds on sheep against fly strike (Lucilia cuprina) during the wound healing process. Milk: DO NOT USE on ewes which are producing or may in the future produce milk that may be used or processed for human consumption. Wool Harvesting Interval: DO NOT USE less than 3 months before shearing or fibre collection. DO NOT USE less than 35 days before slaughter for export. Rams and sheep susceptible to poll strike should be treated. Apply 5 mL of STRIKEFORCE®-S SPRAY-ON SHEEP BLOWFLY TREATMENT to the areas requiring protection, around the poll and horns. When a tail has been amputated, apply 4 mL over the crutch, ensuring sufficient coverage of the open wound. When the tail has not been amputated, ensure sufficient coverage of the tail where the rubber ring has been applied. In the case of ram lambs a further 4 mL can be sprayed over and around the scrotum area after the rubber ring has been applied.